"Serve with any seafood. 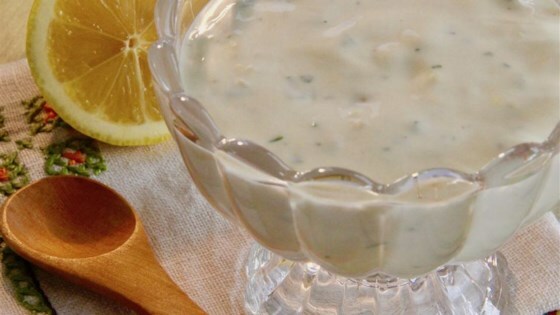 It's simply an amazing dipping sauce." Combine sour cream, mayonnaise, lemon zest, lemon juice, olive oil, parsley, chives, garlic, dry mustard, salt, and pepper in a bowl; mix until smooth. Made this exactly as written. Wonderful! Very good and easy to make. Went well with Connie's Zucchini Crab Cakes! Wouldn't change a thing to this recipe and will make again for use with other dishes too! Thanks for the recipe!